From time to time, I'll share the story behind one or more paintings - what inspired them and/or how they came to be. If it’s foggy, I ask him twice! Whenever there was a clear night, David and I always went outside our home, which we hand-built in the redwood forest, to look for the first star.......It was a little bit of a contest and David almost always “won” because David knew where to look, and I seldom did!..........In honor of David, I wrote this poem, and then created a painting of the first star appearing over our neighboring sheep ranch. One day when David and I went camping at a beach near our home, another couple was leaving. The lady walked to the trash-bin "dumpster" with a wine bottle holding a beautiful "Naked Lady" flower. As she started to throw it away, I asked if I could have it. 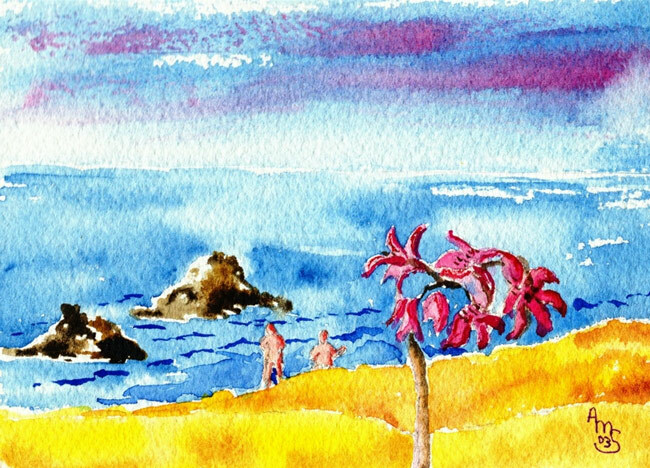 "Naked Ladies" (amaryllis belladonna) grow wild in our area now, but were planted in the early 1900's by settlers on the coastal hills. They are named such because the flowers come up on a long single "Naked" leafless stalk. I put the bottle & flower on our picnic table and admired its beauty silhouetted against the surf and sky. I said to David, "Wouldn't it be funny if naked ladies walked down the beach now!" David replied, "Well, we could pretend!" So I got out my paints and created "Naked Ladies #1 & 2"! We live next to a beautiful and very large sheep ranch near Bodega, Calif., and the sheep have provided us with much joy over the years. They pass within feet of my studio at least 4 times a day, and very often gather under the redwoods to rest or stay cool and/or dry. One day some lambs were born with, of all things, WINGS! 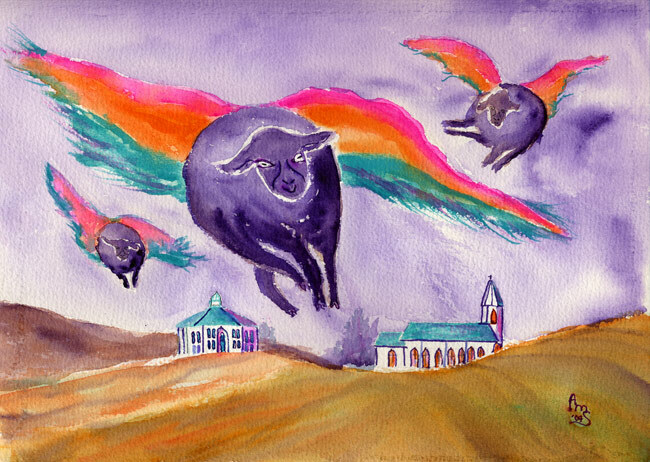 My rancher friend and I nurtured the unusual little lambs, and as their wings developed, I taught them to fly. They are doing very well. Last year, Santa Claus apprenticed 3 of them to ride & fly alongside his sleigh. They did so well that he has declared that as his ageing reindeer retire, he will replace them with our Bodega Flying Sheep! 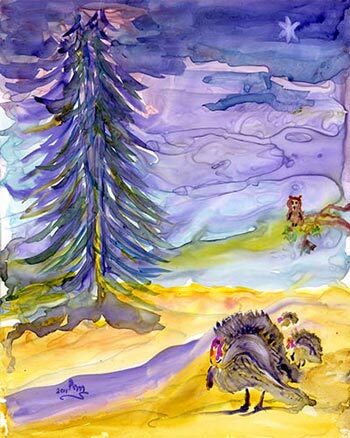 Recently I was invited to do a demonstration of watercolor painting at an "Art Walk" in a neighboring county. When I arrived, about 20 "early bird" people were already seated near the demonstration table. I chatted with them as I unpacked my materials, filled my water containers, laid out my paper & towels. Much to my horror, I discovered that I HAD NO BRUSHES!! My reactions flowed in seconds through shock, disbelief (how could I have not packed them? ), embarrassment, and anxiety. I realized that I had two choices: flee or get creative. I took a deep breath and announced that I was going to demonstrate how to create a watercolor painting using NO BRUSHES! The crowd, now about 30 persons, murmured in surprise and interest. One lady said, "If you need brushes, I have a mascara brush you could use!" I thanked her and said, "No, lets see what will happen!" 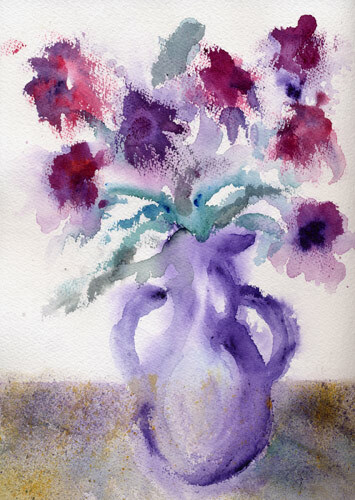 The painting that resulted (Sally's Bouquet) had a home that night and has become one of my most popular note card images. 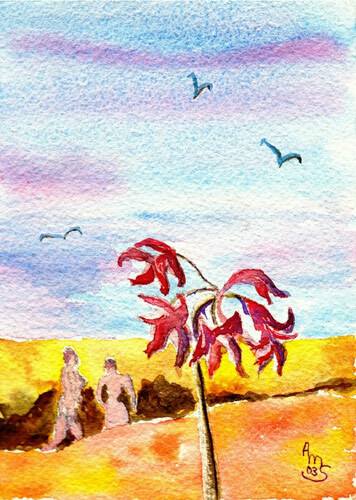 The person who acquired it (Sally) loves the softness of the lines and the colors that flowed off my fingertips! My husband David and I were having a picnic at one of Bodega Bay’s scenic beaches when an ancient, rattley truck pulled up. An old guy got out and opened the passenger side door. Inside were 2 dogs which he lifted up and placed on the sand. It was obvious that all three of them were arthritic and stiff jointed. He and the dogs shuffled to a little knoll on the beach where the dogs curled up. 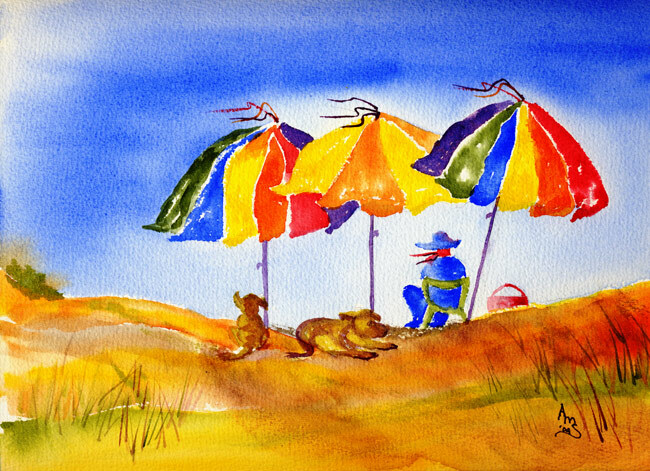 Their master went back to the truck, got 2 beach umbrellas and returned to set them up in the sand to shade the dogs. He returned for a second time for a third umbrella, chair, and his picnic basket. The 3 pals settled in, as they were lulled by the warm sun and soothing surf sounds. About an hour later the sun was just reaching the dogs. We watched as the guy got up, muttered softly to the dogs, and moved the umbrellas instead of the dogs. It seemed such a kind act, sparing the dogs painful repositioning. I was very moved by the gentleness shown to the snoozing creatures. I got out my paints and made a series of small painting called “Waiting for the Tide”. I hope you like this version!